Sign all release of information papers required by Sunrise policy- including information from the Bureau of Criminal Apprehension. Agree to their portion of a self pay obligation shoul they be employed or recieved Social Securtiy benefits while a resident. Develop an aftercare plan with Sunrise staff and with a case manager when applicable. Become familiar with and adhere to all care facility rules and resident responsibilities. 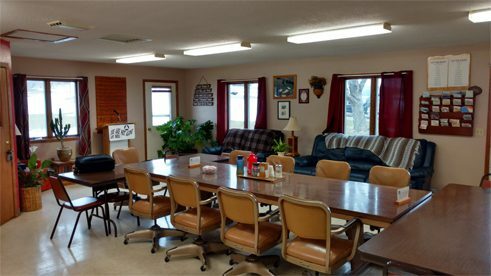 Attend and participate in all house meetings, at least three AA/NA meetings per week, and recreational activities outside the facility. Have (or be willing to submit to) a current physical examination. While residents are not required to attend 12th Step meetings, attendance is strongly suggested. Meetings are held at Sunrise and transportation is provided to several other meetings weekly. A clear attitude of recovery is required at all times. Use of alcohol and other non prescribed drugs at any time or any where while a contracted resident is cause for termination of service.